The first picture shows almost all of the North Pole, surrounded in a dense cloudy haze. Craters Korolev and Alba Mons have been located easily. The second edit shows a similar situation as the first picture, the only difference being that they are on different sides of the hemisphere. 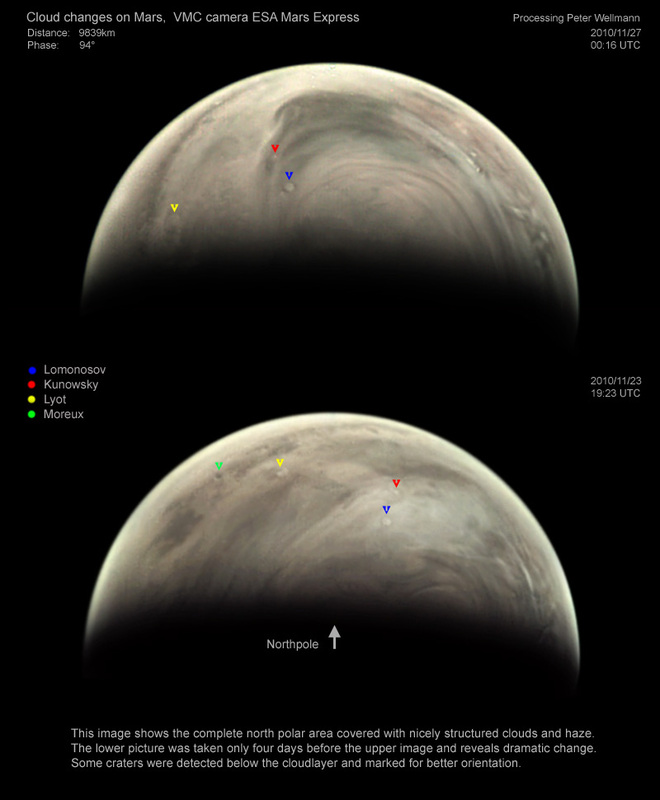 This picture shows the complete polar region and the craters Acidalia Planitia, Lyot and Lomonosov could be clearly detected. The entire pole is covered with nicely structured clouds and haze. The final image is of the complete North Pole covered in a nicely structured haze. The two pictures of Mars were taken about 4 days apart. Some landmarks were identified under the cloud haze. Peter wrote: “This picture combines two VMC-operations; the first took place on 2010/11/23, the second only four days later on 2010/11/27. 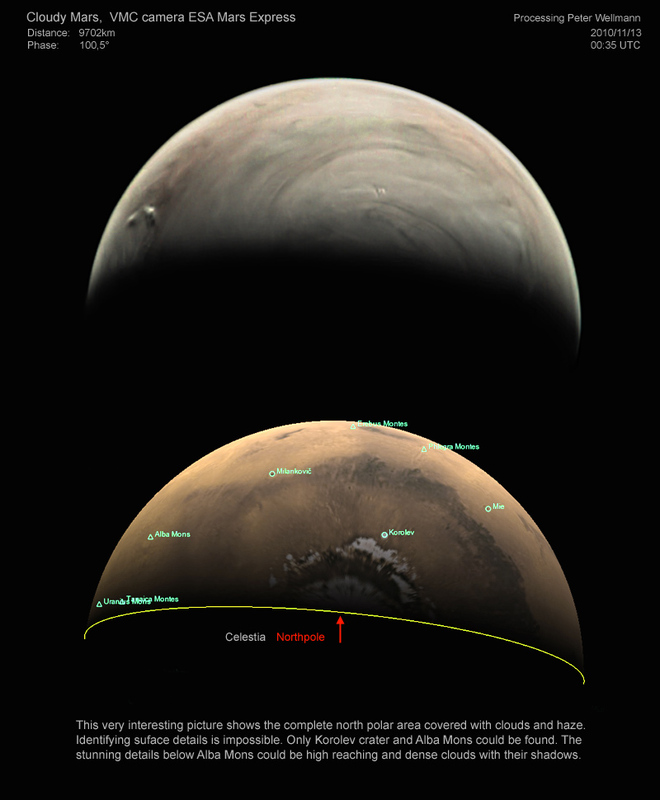 Both operations meet a time with strong cloud and haze-activity on the northern part of Mars. By comparing these images, my idea was to show the rapid change in cloud-structure. Due to the hidden surface it is not easy to identify landmarks, but I was able to locate some prominent craters for better orientation comparing the two images. The supplied dark frame “vmc_flat.raw” was used to extract png-files form the raw-material. Then we sharpened and stacked Pictures No 19/21 and 20/22 in order to reduce noise. The remaining noise was reduced further by utilizing Neat Image software. After cutting out the overexposed part of the stack 19/21 it was combined with the stack 20/22. The colour saturation was adjusted and the background was cleaned. Finally for better viewing the result was resized to 125%. For detailed information on processing see our work done with the astronomy group of Gymnasium Vaterstetten. Remarks: We do not use the library-png because we want to see the colour of the raw-material and adjust it so that for example white clouds stay something ear white. We sharpen every single picture, doing this a bit of noise is no roblem because later two frames are stacked, and a professional noise filter s applied. Artefacts must be cleaned from each picture before stacking; hoosing pictures with artefacts not in the same place will preserves some riginal information for all parts. We align two frames in order to reduce oise, for this usually one image must be rotated a bit. We stack separately for igh and low exposure. Fitting the high exposure section to the low exposure icture is done by feathered selection and must be tried out very carefully. Cleaning the background is done by a 2px feathered circle-selection very lose to the rim of Mars; then a 15-20px feathered oval selection is used at he terminator. This must be done carefully not to alter the original picture ore than necessary. If adjustment of colour saturation results in a bad colour oise, this may be reduced by applying a noise filter to the colour information nly (definitely not affecting the luminance). For this we separate luminance nd colour by Photoshop. At the end some 'fine-tuning' may be favourable for example feathered selection on a cloud patch to enhance white colour and o on). We do this carefully and moderately in order to preserve the original content of the picture.